After having some trouble getting a full width and height map working with Angular Material, I am sharing my solution to hopefully spare others the same pain. The solution isn’t anything special, but I did find it tricky as I hadn’t used Angular Material before. For this example, create a new angularjs scaffold as described briefly at https://github.com/yeoman/generator-angular, or in a more detailed tutorial at http://yeoman.io/codelab/index.html. And that’s it! 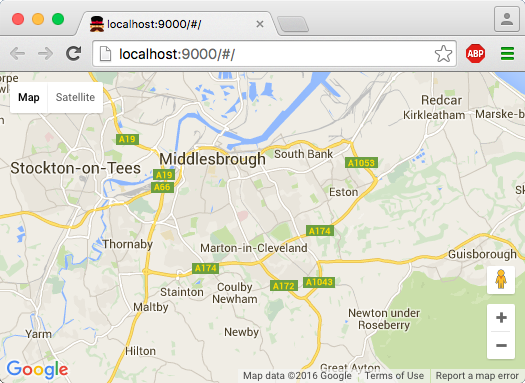 I’ve used this technique on my NE Travel Data website showing live CCTV camera images on top of a Google Maps traffic layer. If you have the time, check it out at the link below. The code for this example can be found on Github at https://github.com/TolonUK/angularjs-googlemaps. Previous PostBeware setlocale() in Visual C++ 2012 onwards! Holy cow. What a humble genius you are.